President: Mrs. Landry R. Harwood, Jr. The Memorial Church of All Angels will commemorate the 75th anniversary of the celebration of the Holy Communion on August 1, 1971. The first service of the Holy Communion was held on August 2, 1896, with the Rev. Dr. George Williamson Smith, President of Trinity College, officiating, and at which time 77 persons were present. The 50th Anniversary Service was conducted by the Rev. Canon Bradford H. Burnham and 103 persons attended. 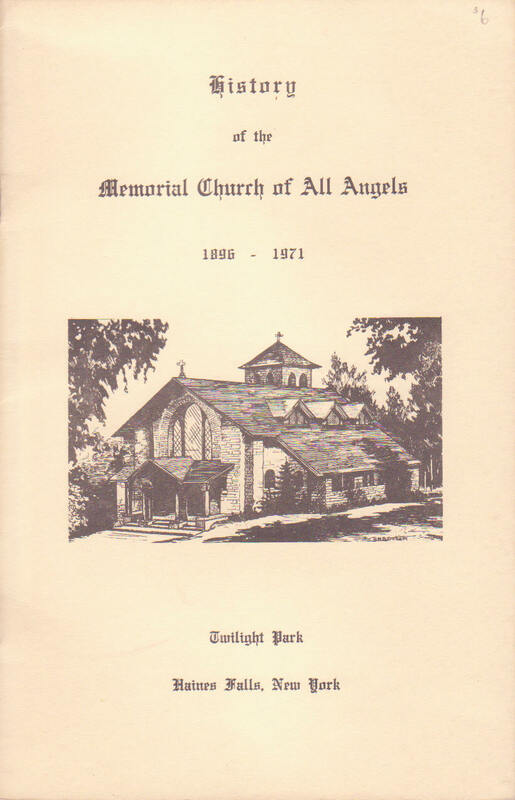 The origin of the Memorial Church of All Angels goes back to 1888 when Twilight Park was founded, as a small group of cottages and camps where nights were cool, and the days not too hot. The Park itself rises 2,500 feet above the Hudson River Valley, between, and to the west of, Kingston and Albany. Two years later, the Rev. Dr. H. M. Baum from Evanston, Pa., an early visitor to the Park, realized the need for an Episcopal Church, and funds were raised to build a small chapel. Services held there soon became so crowded that it was necessary to add transepts and a Rectory was built. This first little church, named “St. Paul’s,” after functioning for three years, failed for lack of funds to prevent foreclosure of its mortgage, and reverted to the builder, together with the Rectory. The Rev. Dr. Baum, disappointed in his effort to meet a need for a place of worship, left Twilight Park and the properties were converted into cottages. The real history of All Angels dates from 1895, when the Rt. Rev. Henry Yates Satterlee, the first bishop of Washington, then the Rector of Calvary Church, New York, had taken the cottage of his cousin, the artist Walter Satterlee, for his summer home. This cottage is now owned by Mr. and Mrs. Landry R. Harwood, Jr. On June 16, 1895, his first Sunday in the Park, he celebrated the service of Holy Communion there, and invited all those who wanted to come, to do so. Several weeks later the guests at Ledge End Inn asked him to conduct services in the parlors of the Inn. At this point, a strong desire having been expressed for a permanent place for Episcopal services, which had been held at the various Inns, assisted by the Rev. Wm. T. Langford, George C. Groves, L.T. Watson, Professor Walpole and other distinguished clergy, Dr. Satterlee was gratified to accept an offer from the Twilight Park Association for a piece of land near all four Inns; namely, Squirrel, Santa Cruz, Ledge End and Twilight Rest. This proposed church, planned by the architect Alexander Mackintosh, was to be named “All Angels” by Dr. Satterlee. He pointed out that this was an uncommon name, not having been adopted by any other church in the Diocese of Albany, and that the feast of St. Michael and All Angels occurred on the fourth Sunday in September when many residents would still be in the Park. On November 9, 1895, in a deserted Twilight Park, the cornerstone of the church of “All Angels” was laid by the Rev. Henry Y. Satterlee, in the presence of Mrs. Satterlee, Churchill Satterlee, Miss Constance Satterlee and the chilled workmen. It was a very cold winter, but work continued and the church was nearly ready for use in 1896. by July 25th, the walnut altar had been given by the family of Mr. W. M. Matthews, who died before the church was finished, and a walnut reredos was presented by the Rector and Vestry of Zion Church, Wappingers Falls, Dr. Satterlee’s first parish. It was originally designed by Mr. Joseph Lamb and stood behind the altar where Dr. Satterlee officiated between 1897 and 1882. The frontal, lectern fall, and stole had been presented by the Embroidery Guild of St. Martins-in-the-Fields, Philadelphia, and other important gifts were received which have been tabulated in the back of this history. The Church was very bare, forty-three feet square inclusive of the chancel. The west end was finished with rough boards, not built of stone like the other sides. The first service of the summer of 1896 was held in the cottage of Mr. W. H. Cope who acted in the church as lay leader for many years. On July 19th, the Rev. James P. Faucon held a Morning Prayer and Sermon, using the south aisle of the new church only. On August 2nd, the Rev. W. George Williamson Smith, President of Trinity College, held the first service of the Holy Communion with seventy-seven persons attending. Bishop Satterlee was not present in 1896, as he was in Europe, where, as Bishop of Washington, he was commissioned to go to Russia to present to the Czar a petition from all American and English Christian Bodies on behalf of the Armenians. On September 20th, 1896, Bishop Satterlee returned, and services were conducted by him through September 29th, the Feast of St. Michael and All Angels. During the summer of 1897, seats were placed in the church, and on August 8, 1897, the first Evensong was held at 5 P.M. with the Rev. Jacob LeRoy officiating. Bishop Satterlee was devoted to “All Angels” and until his death in 1908, he served as missionary in charge during July and September, and in August the following clergymen took charge: The Rev. Churchill Satterlee, Dr. Alfred Harding (afterward successor to Dr. Satterlee as Bishop of Washington), The Rev. Canon William DeVries, known as “our strenuous Rector,” is photographed standing in a dark suit and bow tie, beneath the long done Lich-gate with a shovel in his hands. The original church record shows the names of very distinguished clergymen who officiated throughout the years. Many services were held in the late 1890’s, recorded on Wednesdays, Fridays, and perhaps three on Sundays. Five o’clock on Sunday was a most popular time to go to church, and the record book shows large attendance then, unless, of course, it rained, or it was damp, and there were thunderstorms. The clergy recorded all these facts and by 1900 the attendance had exceeded 10,000. In 1908, Bishop Satterlee died but he had left behind him a church which continues today, in a different world, certainly, but a fundamental part of our community. At that time a committee was formed to change the name to the “Memorial Church of All Angels,” and additional funds were raised for its completion. The first organ was dedicated in memory of Churchill and Walter Satterlee by members of the parish, and in 1909 the west end and porch were completed. Alas, in 1909 comes a sad note in the record book; on July 10th, 15 people sang Hymn 11 without the organ. This year there are many remarks about organ failure, singing with, or without it. Perhaps indeed two hymns would be sung, and then the organ played no more that day. No new organ was purchased until 1917 when one was dedicated by Canon J. W. Austin, at which service 180 persons were present. Although the church was finished in 1909, due to complications connected with the title, the consecration did not take place until July 13, 1913, the eighth Sunday after Trinity, with the Rt. Rev. Richard H. Nelson, Bishop of Albany, preaching the sermon, Mr. F. W. Rhinelander, Senior Warden, reading and presenting the instrument of donation, and Canon DeVries reading the sentence of consecration. Thus, the Church was dedicated to the memory of its founder, and formally deeded to the Diocese of Albany. In 1917, there was a service of War Intercessions, at which 150 people assembled. Stirred on by patriotism, there was a Dedication of the Flags Service, a commemoration of the departed of the “Great War” and a Thanksgiving Service for the ending of the war in 1919. “St. Francis of Assissi [sic],” at which time Bliss Carman read his own poems to 16 persons who contributed 95 cents. 2. “Thomas a Kempis,” to 19 people and $1.00 was collected. 3. “Jeremy Taylor,” 18 in attendance gave 95 cents. 4. “John Bunyan,” delivered to 22 persons who donated $4.85, to the end of the season of 1926. There is no record of any more such erudite talks in the church. In 1935, Deacon Edward C. Colcord, and the Rev. James L. Whitcomb, principal of the Hoosac [sic] School in Hoosic, N.Y., held services every day, starting on June 30th and ending September 8th. There were at least two on week days and four on Sundays, and one Sunday service was particularly devoted to children. The church register states that the total attendance at the Sunday services in 1935 was 1173, and 263 people were present at the 113 daily services that were held during that year. Daylight saving time came in 1939, and with it a diminution in the number of services. Today, we hold services on 10 Sundays. The last celebration of the Feast of St. Michael and All Angels was held in September of 1933 with eight persons present. Firmly established, there were baptisms, confirmations, weddings, memorial and burial services through the ensuing years. World War II came and the wives and their children still went to Twilight Park, while their men went to war. As Bishop Satterlee had predicted, the sound of our Bell rang over Twilight homes that night. How right he was! Our present rector, the Rev. Canon Bradford H. Burnham held his first service in the church on August 5, 1945, and except for short periods of time when Bishops and other eminent clergy officiated, has continued to devote his summers to the Memorial Church of All Angels and his parishioners. There have been numerous gifts and bequests of money to the church, and each year the Women’s Auxiliary, which first met in 1897, has had benefits of various natures, raising money to make a substantial contribution to the maintenance and improvement of both the Rectory and the Church. Like most organizations erected to the glory of God, the Memorial Church of All Angels owes its genesis to the inspiration, imagination and practical energy of a great man, who was ably assisted by other forward thinking men. Henry Yates Satterlee, who was to become the founder of the National Cathedral of SS. Peter and Paul on Mount St. Albans, Washington, D. C., and its first bishop, gave the initial push which has caused our little church in the mountains to endure in the tru spirit of worship for 75 years. 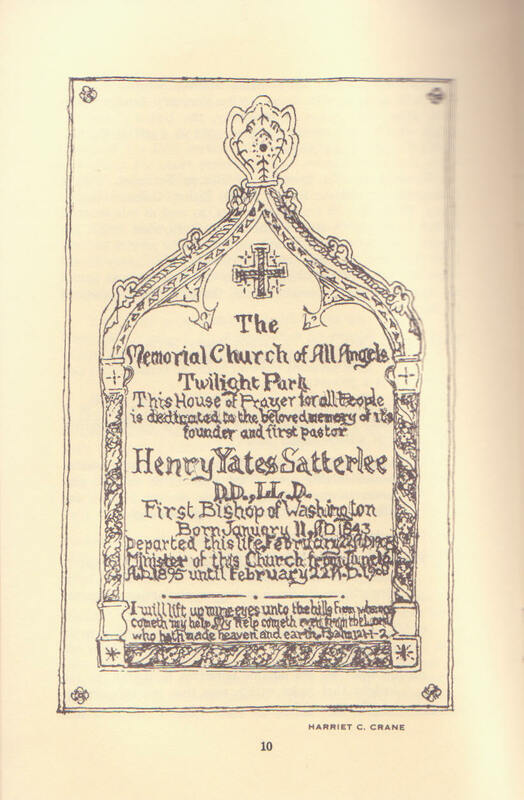 When the land for the National Cathedral became available to the Episcopal church, Bishop Satterlee sent telegrams from Twilight Park to the scattered members of the Board of the Episcopal Foundation, and within 24 hours had mustered their consent to its purchase. We have always been closely connected with the National Cathedral in Washington. In September of the year 1895, after All Angels was founded, Union Chapel was incorporated. By 1897 a handsome stone building had been erected at a total cost of $5,570. For the next 70 summers, services were held regularly each Sunday. The Union Chapel never had a missioner in charge except for a period of 4 years, when the Rev. Mr. Cary headed the Chapel. Many distinguished clergy, university presidents, and theologians spoke from its pulpit. Its progress was enriched by a children’s choir and a Sunday School. Benefits were held each summer by an active Women’s Auxiliary. In 1970, after three years of inactivity, the Union Chapel together with its endowment was presented as a gift to the Memorial Church of All Angels. Honored by the presence of Bishop Satterlee, Bishop Doane, Bishop Nelson, Bishop Brent, Bishop Oldham, Bishop Barry, Bishop Brown and many others, as well as missionaries to far away places and distinguished Clergymen, today the church looks forward to many years of useful service to Twilight Park and the community of Haines Falls; to try to advance the cause of Christianity under the inspiring and spiritual leadership of our present rector, the Rev. Canon Bradford H. Burnham. “Faith is a powerful force. It calls for sacrifice, or it sets the blood at a boil, or it takes as its incentive the impossible which requires just a little longer to do. In forceful men, beside just brain-power, faith accompanies intelligence. What does faith do but give power to our thinking, force to our conclusions, and life to our convictions! Faith gives insight. Faith is the evidence of things unseen. My! What it does with the unseen in us. It nourishes it, it strengthens it. Faith makes an everlasting character out of the moral nature of a man. We need evermore the insight to shape the growth of our spirit. Frontal Embroidery Guild of St.
July 14 Green Silk Embroidered Stole St. Luke’s Episcopal Church, Phila., Pa.
Silver Paten & Chalice By St. Stephens Church, Washington, D.C., through the Rev. G. Dudley, Rector. Gift of Curtains Mr. and Mrs. Frank W. Hubby, Jr.
June 8 $1000 Left by Nora Lowe McKee for a new organ, supplemented by generous gifts from members of the parish. & Ciborium In memory of Wortham Collins. Aug. 2 Park Union Chapel, Inc. All assets deeded to the Memorial Church of All Angels. 1964 William Wortham Collins, Jr.
May 28, 1908 Clifford Pemberton, Jr. – Anita LeRoy both of Phila. Aug. 2, 1896 First celebration of the Holy Communion. Aug. 19, 1900 Thanksgiving Service for deliverance from fire in the woods. Sept. 14, 1902 Service in commemoration of the Coronation of King George and Queen Mary. July 25, 1908 Dedication of an organ in memory of the Rev. Churchill Satterlee and Walter Satterlee. July 13, 1913 Consecration of the Memorial Church of All Angels and deeding to the Diocese of Albany. July 11, 1915 Dedication of the Bell Tower and Bell. Sept. 9, 1917 Dedication of an organ presented by members of the Parish. Sept. 23, 1917 Service of War of Intercessions. July 21, 1918 Dedications of Flags. July 27, 1919 Thanksgiving Service for the ending of War. July 3, 1921 Patriotic Service. Address by Admiral C. H. Stockton. July 25, 1943 Dedication of window in honor of Rt. Rev. G. Ashton Oldham. Aug. 27, 1944 Dedication of Honor Roll by the Rev. Howard S. Kennedy. Aug. 15, 1945 Peace Service for the end of World War II. Aug. 26, 1945 50th Anniversary Service of the Church. Aug. 29, 1945 Homecoming Service with Union Chapel congregation as guests. Aug. 11, 1963 75th Anniversary Service of the founding of Twilight Park. Sept. 6, 1967 Ordination to the Priesthood of Frederic Bradford Burnham by the Rt. Rev. Allen W. Brown. In grateful appreciation of the men from these Parks who served their flag and Country, on Land, Water and in the Air. This Tribute is offered by their loving Neighbors and Friends. Stanhope E. Blunt Lefferts Hutton, M.D. Frank M. Dazey Charles Townsend Olcott, M.D. Your Prayers are asked for those who have gone to serve our flag and country by land and sea and air. L. Gardiner Hallick *Charles E. MacAllister, Jr.
Nathaniel Hathaway Walter E. Roehrs, Jr.
John A. Hubby John G. Underhill, Jr.
Mr. & Mrs. Wm. P. Huston James Kent, M.D. Harvey Bostwick Lefferts Hutton, M.D. This service was always held in September so that our friends from Union Chapel could join in. Last one recorded 1935. 1963 Kemp Catlett Christian, Jr.
Aug. 21, 1932 James Manning Kent, M.D., at Arlington, Va.
$5,000 Bequest from Mrs. Frank W. Hubby, Jr.